Maybe it’s Spring cleaning or maybe it’s Tidying Up with Marie Kondo, but either way, organizing has never been so trendy! Keeping your home organized can feel like an uphill battle, but with a few of these secrets of professional organizers, you’ll conquer your clutter once and for all! Here are 21 secrets of professional organizers that will get you started. 1. Don’t buy storage containers…yet. Often, those who are just starting on their organizing journey will become inspired by photos of perfect pantries or cabinets filled with rows of neat clear bins and rush out and buy the same exact setup. This is a mistake! Instead, wait until you have sorted through your items and know exactly what you are keeping in the area first, then buy your containers. What you need and what you think you need varies dramatically in most cases. 2. Buy a label maker. You would be surprised at what you will use your label maker for. It will quickly become one of your most-reached-for tools as you sort through items and put them away. Everything just looks nicer with labels! You can keep your label maker simple like this one, or splurge and buy a vinyl-cutting machine that you can use to create custom labels of any shape, color and size. 3. Take advantage of digital storage and helpful apps. Tired of paper clutter? Here’s how to get rid of it all thanks to secrets of professional organizers. In this day and age, there are apps for nearly every purpose under the sun. Organizing is no exception—there are several helpful apps that organizers find themselves reaching for over and over. Cut the paper clutter by scanning important documents or mementos with a portable scanner. Then, download an app like Google Drive or Evernote which allow you to store and sort items. 4. It is much easier to remove clutter than it is to create storage space. The goal of organizing is to make the most of the space you have, not to create more space. When you start to think in these terms, your view of how to move forward shifts completely. 5. Get the entire family involved. Okay, this might not be a secret of professional organizer but it’s important enough to mention in case you haven’t heard (or implemented!) this one. The organizing process is nearly impossible if you cannot get others who live with you to get involved in the initial organization AND the daily maintenance of the task. 6. Treat your home as if you are a guest, not a resident. Most of us don’t go stay at a friend’s home and rifle through the linen closet, leaving it amuck. Instead, we would carefully pick through to find what we needed, then put things back exactly as they were. Likewise, you should offer your home the same respect and care. 7. Find the easy places to start. If you have an entire house to sort, it can feel extremely overwhelming. However, if you can find easy places to begin, you are likely to build steam and momentum to move onto the more difficult places. While easy spots can be different for each person, in general, some beginner-friendly spots to tackle include the kitchen pantry and refrigerator (toss any expired food, then group the rest) or the linen closet (group towel sets, toss old sheets, etc). 8. Stock up on some inspiring reads. There are a few books that are like absolute eye candy to anyone with organization goals. Grab a few of these and allow yourself to be inspired. These include The Home Edit, The Life-Changing Magic of Tidying Up and The Complete Book of Home Organization to name a few favorites. 9. Only keep necessities out in the open. Your desk will appear much tidier if you only keep necessities out like a lamp, a filing tray and a stapler. Everything else should be stored in a drawer or cabinet. 10. One item out for every item in. Fall in love with a new vase? Bring it home—then get rid of one you already have. With the exception of those who are just beginning to fill a home, the vast majority of us have more than enough things in our home. Make it a rule that you get rid of one thing for every new thing you buy. 11. Trays are your friend. One of the best-kept secrets of professional organizers is their use of trays in virtually every area of the home. Trays can corral bottles of lotion and perfume on a sink top or bottles of olive oil and spices on your kitchen counters. Need a place to keep papers on your desk or magazines on your coffee table? Grab a tray. 12. Keep items in your car. This is not a free for all, but some items truly do belong in your vehicle, not your home. Purchase a trunk organizing bin and fill it with items like reusable grocery bags, coupons, and items that need to be returned to the store. Don’t forget to grab a trash can for your car while you are at it! 13. Only touch an item once. One of the most popular secrets of professional organizers? Only touch it once. This is basically a fancy way of saying put it where it goes the first time. For example, don’t walk in the door and drape your jacket over the couch and kick your shoes off on the floor. Chances are, you may not go back and pick them up to put them away in the closet—and if you do, it will seem like a much larger hassle than just putting them where they belong in the first place. 14. Understand there is no such thing as multi-tasking. Not only is multitasking a myth, but it is also actually a drain on your emotional and physical resources. You cannot organize your linen closet while simultaneously organizing the playroom. Give each task the attention it deserves, fully complete it, and then move on. 15. Know that purging never ends. You don’t get to organize once and never have to do it again, unfortunately. It is a daily commitment to purge continually. This is much easier if you do this daily rather than once a year. Make it easy for yourself by keeping items in place that encourage a quick purge. Your closet should have a donation box where you can quickly add clothes. It is also a good practice to keep a donation box somewhere like the garage or car where items can be added, then taken out and given away as needed. 16. Use vertical space. Think tall! There is so much vertical space in the home that goes unused. One example is underneath the sink—there’s a good amount of height there and it probably goes completely unused in your home. Find stacking bins to place there and take advantage! Just make sure to label containers so you know exactly what’s inside them. 17. Know your expiration dates. It is far too easy to allow toiletries to pile up at the back of your bathroom drawer. However, if you are conscious about the dates these items go bad, you are able to toss items without the feeling of false guilt. 18. Adjust shelves. This one seems so obvious, but so few people actually do this! If you have a shelf height that isn’t working for you…change it! This goes for kitchen cabinets, pantries, bookshelves, media units, medicine cabinets, refrigerator shelves, etc! 19. Get rid of packaging. In general, cardboard and plastic packages are unsightly, take up too much room and cause clutter. Instead of storing cereal in a cardboard box, invest in some clear airtight food containers and pour it in there. Your days of stale cereal is over! Which one of these secrets of professional organizers did you find most helpful? I am itching to get to work and start creating some decluttered space! 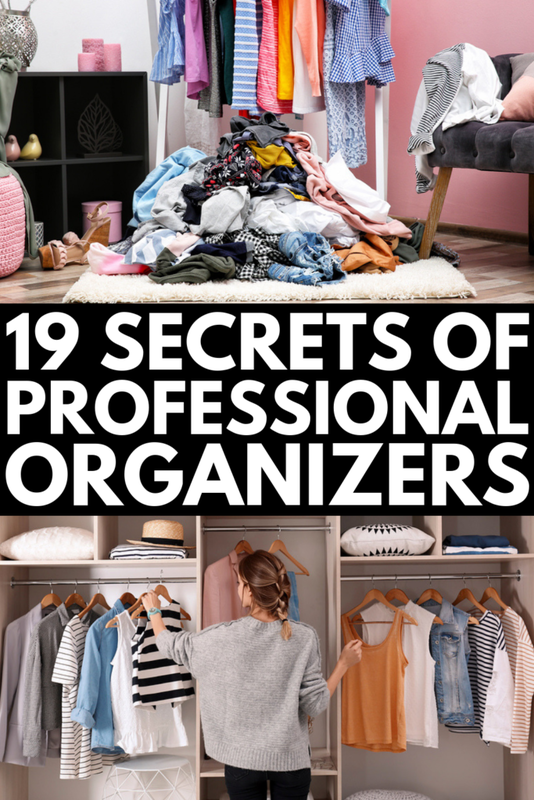 If you found this collection of secrets of professional organizers helpful, please share this post on Pinterest! And if you’re looking for more household tips and tricks, please follow our Cleaning board where we share all kinds of helpful ideas we find each day!